REVIEW: Academic terms are designed to work independently of one another. So for example, if you make changes to subjects, enrolments or grades for one academic term, it will not be reflected in other academic terms. This is true even for grade levels / programs. If you add a new “13th Grade” or a new “Bachelors of Arts” program for this academic term, it will not appear in previous academic terms. But schools don’t want to have to create all that data (from scratch) over and over again whenever a new academic term is created. And so we introduced this concept of archiving/migrating the academic term. What this does is copies over all the data from the previous academic term, and copies it into the new academic term. From then on, you can make changes to the new academic term safely, without effecting information from the previous academic term. This screen can be accessed via the “New Semester Setup” > “View All Semesters” screen, or via the “Admissions” > “View All Semesters” screen. Simply use the “Add New Academic Year” and “Add New Term” buttons to create empty academic terms. Remember, if you use this method to create a new academic term, you should refrain from activating it, because there’s no data in there. Only when subjects are created / copied over do the gradebooks get created as well. 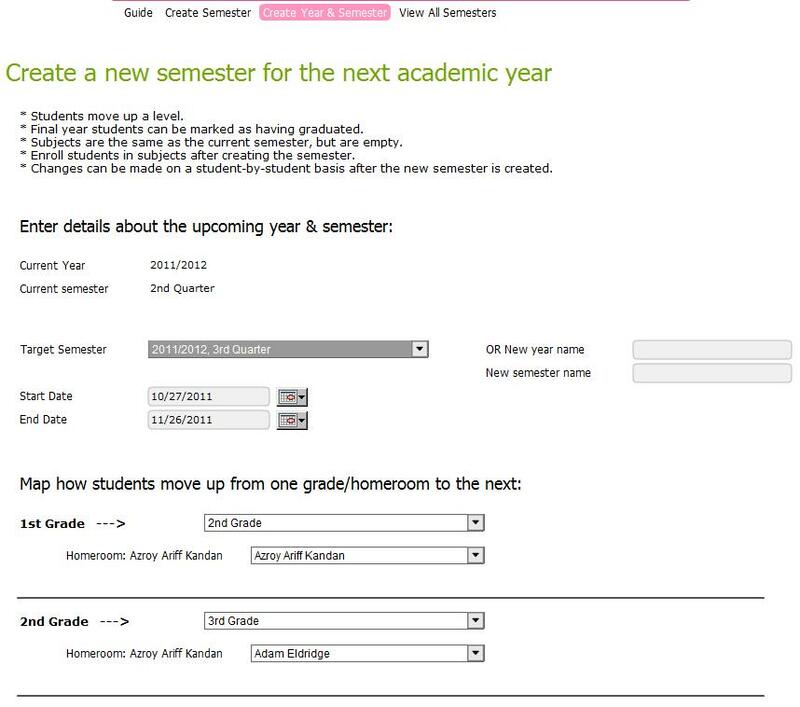 This screen can be access via the “New Semester Setup” > “Create Semester”, of via clicking “OPTION 1” under the “New Semester Setup” > “Guide” screen. Just fill in the form, and click on “Create New Semester”. If you’ve already created an empty academic term (METHOD 1), you can select it from the dropdown. Also, be sure that the correct academic term (to be archived / copied) is activated. When you’re done, you can review the changes via the “View All Semesters” screen. 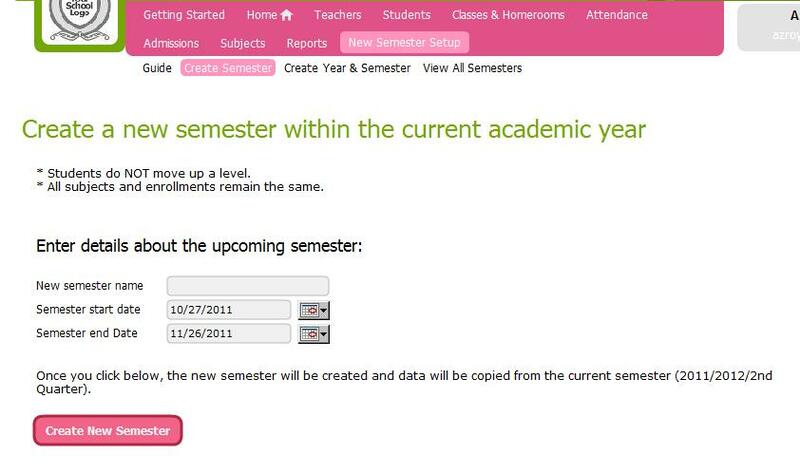 This screen can be access via the “New Semester Setup” > “Create Year & Semester”, of via clicking “OPTION 2” under the “New Semester Setup” > “Guide” screen. You’ll see that on this screen, you can match how the students are promoted. Simply click on “Create New Semester” at the bottom of the screen to complete the process. QUESTION: I don’t have the “New Semester Setup” menu. How do I get it?